The status tab in the Control Panel provides real time status about the number of interactions waiting to be served in a queue, the longest waiting interaction in a queue, the number of eligible agents in busy state, and the status of fellow agents. Supervisors can check the status of queues and agents they supervise, communicate with agents instantly through chat or call. Agents tab—View status of other agents belonging to your group. Queues tab—View status of queues you are a member of. Search and retrieve status about a specific queue or an agent instantly. Search is not case sensitive. Note: If you are disabled to serve a queue, you can still view the status of that queue, but the queue appears grey in the directory. 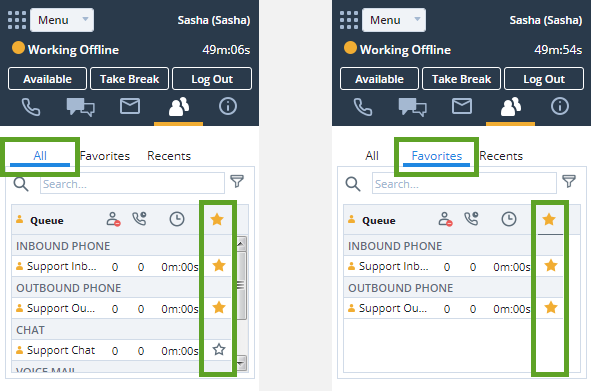 Bookmark agents you contact often and queues used often and track their status every time you log in with just a click on the Favorites tab. For example, you are one of the five managers in AcmeJets Support agent group. You manage seven team members out of the 50 members belonging to the group. You can mark these seven team members as your favorites and monitor their status with just a click rather than sifting through the status of the whole team. Track those agents with who you initiated a call or a chat session in the past. The Recents tab lists those agents and displays their status. Your search results are locally stored. Note: Does not qualify participation in a chat or a call.